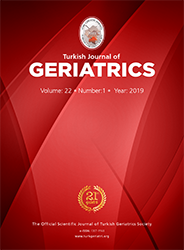 1University of Health Sciences, Fatih Sultan Mehmet Health Research and Application Center, Anesthesiology and Reanimation Department, İstanbul, Turkey DOI : 10.31086/tjgeri.2019150568 Introduction: Demographic changes have resulted in increasing numbers of geriatric patients needing respiratory support in intensive care units. Conversely, these patients are faced with an increased risk of weaning failure and can be discharged with home mechanical ventilation. This study aimed to investigate the discharge status and home mechanical ventilator use of the elderly patients who experienced weaning failure. Materials and Method: We retrospectively investigated the data of 51 patients older than 65 years who required home mechanical ventilator prescription due to delayed mechanical ventilation during their treatment in intensive care unit between January 2016 and January 2018. Results: The patients" mean age was 78.33±8.12 years. Twenty-six patients (51%) switched to home mechanical ventilator, 12 weaned and 13 died before switching to home mechanical ventilator. Eleven patients (42.3%) were discharged with home mechanical ventilator and 15 (57.7%) were spontaneously breathing. Four patients were prescribed palliative care, 3 were sent home, 3 to a nursing home, 2 to the hospital ward and 14 to a secondary intensive care unit. After discharge, 9 patients were re-admitted to the intensive care unit and 12 of the 15 patients we contacted, died within 1 year.